Kvarkadabra blog: The Man Who Counted Infinity [Kindle Edition] - danes BREZPLAČNO! 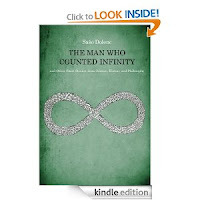 The Man Who Counted Infinity [Kindle Edition] - danes BREZPLAČNO! Knjiga The Man Who Counted Infinity and Other Short Stories from Science, History and Philosophy [Kindle Edition] je danes 31. 12. 2012 na Amazonovi strani na voljo brezplačno!